There’s an interesting phenomenon when it comes to coffee in the Sydney CBD. It’s fast. It’s cheap. It’s abundant. It’s usually pretty good. But there’s not often time to blow your mind at 9:45 on a Tuesday morning. And come the weekend, going out for coffee becomes a daunting prospect as the men and women in suites retire to the inner and outer suburbs for a spot of R & R and CBD coffee more or less shuts down. Another phenomenon is the ‘black holes’ all over the CBD. Sure, you’re spoilt for choice on the Surry Hills/CBD border, but what about Chinatown/Ultimo? I struggled to think of anywhere off the top of my head, but then, Ultimo never really occurs to me as a place to go for coffee. Until now. 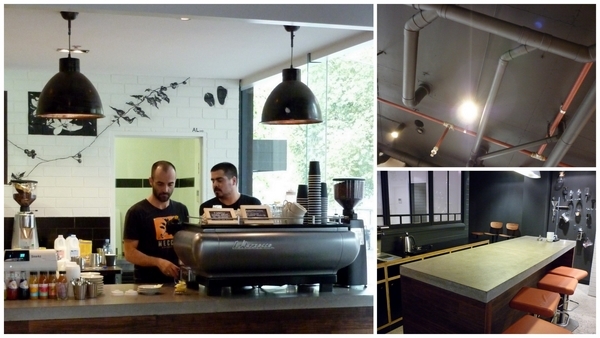 There are a few well known ‘solid’ cafés in the CBD and Mecca is often cited as one of them. They now have three stores, one at 67 King Street, one at 1 Alfred Street and the newest addition in Ultimo at 646 Harris Street, just down from ABC studios in what used to be Gloria Jeans. Having previously checked out their King Street café I decided to give the Harris Street Mecca a go as it is sort of walking distance from my place and only opened last month. The interior of Mecca is quite spacious so there’s plenty of places to sit, with polished concrete floors and sheet glass windows. The decor is sparse but welcoming, old-style wooden school chairs and polished black tables arranged in an orderly fashion. Not unlike Don Campos, the decor screams professional, but in this case with a touch of quirkiness. We ordered and payed for our two macchiatos at the counter before sitting down. Our coffees came promptly and were a tad milkier than many macchiatos, but I never consider that a problem myself. The flavour was creamy and rich and it was nice to sit for a while and not worry that we were taking up a table. I’m used to the cramped cafés of Newtown and surrounds which are generally pretty tiny, not the kind of places where you could spend the whole morning. Mecca also have a breakfast and lunch menu with various toast-with-stuff options for breakfast and sandwiches, salads and Panini for lunch, which all seemed very reasonably priced. There is also a liquor licence in the works. All in all a solid experience and I would definitely visit again. What are your top picks for places to go in Ultimo? Thanks! I want to give the food a try for sure, especially at such reasonable prices. Didn’t get a glance at anyone eating, I guess the focus is n the coffee. And it was 10am. How have I never seen coffee trails before? Is that this post you wrote? I think I know the cafe you mean, near the ABC? I’ve never had a chance to check it out though. ohhh good post! I’m always on the look out for good coffee whenever I make the trek into UTS city campus. I usually go to a Toby’s Estate cafe on Harris Street that I love. I cant recall the name though! I am definitely gonna check out some more places around Ultimo. I never think of it though. The only place I’ve really been to lately is Baker Street. Great coffee shame about the staff…I think believe they are too hip to smile. The girl is just rude!